Running back Thomas Rawls #34 of the Seattle Seahawks stands with center Justin Britt #68, right, to join defensive end Michael Bennett #72 on the bench during the national anthem before the game at CenturyLink Field on September 17, 2017 in Seattle, Washington. 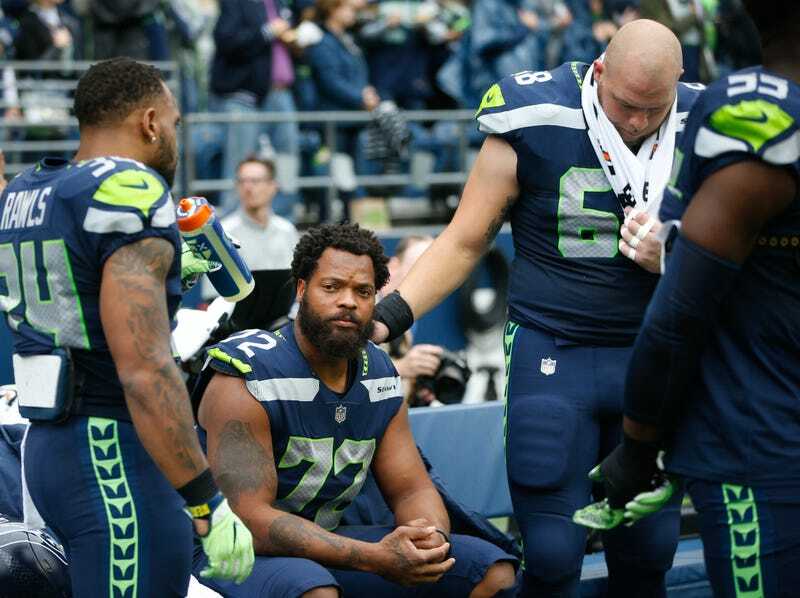 New England Patriots defensive end Michael Bennett has been adamant about the movement for black lives. He was one of the first NFL players to back former San Francisco 49ers quarterback Colin Kaepernick’s kneeling protest during the national anthem, and he doesn’t plan on stopping just because President Trump’s favorite team has picked him up. During a speech at Princeton University this week, Bennett noted that being traded from the Philadelphia Eagles to the Patriots hasn’t changed one thing as he would keep up his protest—and not just on the field, ESPN reports. And, yes, the Patriots brass is aware of Bennett’s intentions, but I’m sure Patriots owner Robert Kraft has a lot of other things on his mind right now. Patriots coach Bill Belichick and the owner of the world’s deepest chin divot, Tom Brady, are also believed to be Trump supporters, and Bennett has expressed that he wants to speak with them as well. “I think it’s an opportunity for growth to have those conversations,” Bennett added. “If we don’t allow ourselves to have those conversations, we’re stunting our growth. Bennett is a force on the field and helped vault the Seattle Seahawks defensive to a Super Bowl in 2013. The Patriots already know the kind of cloth that Bennett is cut from since his twin brother, Martellus Bennett, used to play for the team.